Recently the LinkedIn and Facebook pages of the “Providence Geek Dinner for Wednesday, September 23rd” caught my eye. After attending social media events in Boston, it was high time for me to check out what was in Rhode Island. Curious, I reviewed the attendees and recognized some friendly names. Hmmm… I thought, “What the heck, why not go? Maybe I could find a connection to a job.” Not sure what to expect, I dressed comfortably in “office” attire. Knowing that first impressions last forever, I wanted to look polished, but not stiff. Taking deep breaths, I drove downtown to Trinity Brewhouse to see what awaited. After popping into Trinity, I quickly spotted my friend Sara Streeter. 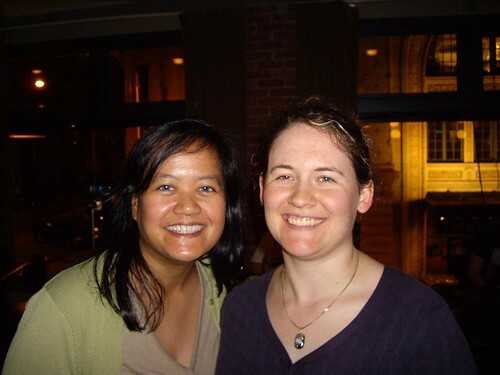 This social media savvy guru and I met during Podcamp Boston last August. Of course I was pleased to discover that she is also a fellow knitter. 🙂 If I failed to recognize anybunny else, I apologize. The downstairs area of Trinity Brewhouse is quite dark, and if folks did not approach me, I obviously was not able to converse if I could not see them. 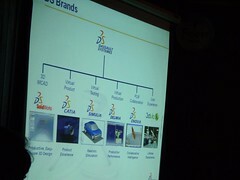 The company featured in that night’s presentation was Simulia. This software company specializes in third dimensional graphics, and I was smitten with their work. All I kept asking in my head was what did I need to do to work for them. Their ties into industrial engineering kept me mesmerized, that is, until my stomach reminded me to get food into my body. 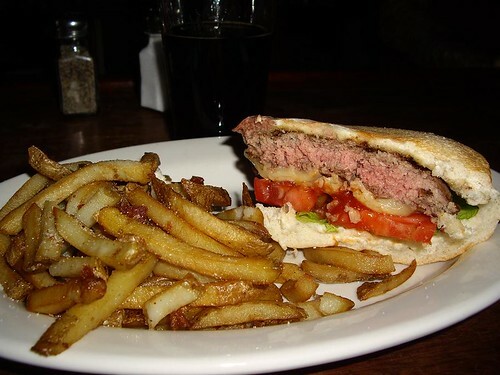 Note, I love bacon cheeseburgers, particularly those with only lettuce, tomato, mustard and ketchup. For the cheese, cheddar is my preference, but I love smoked Gouda too. From seeing the photo above, Trinity Brewhouse has a nicely sized option. Seated at the bar, I was gobbling down that and one of their heavier beers, the Russian Imperial Stout, when I recognized the man standing on my immediate right. “Hello, Mr. Cicilline,” I greeted the Mayor of Providence, “How are you? I had no idea you were into the Providence Geek Dinners. Are you into technology?” We ended up chatting for a bit, and I shared how I was in IT and QA. 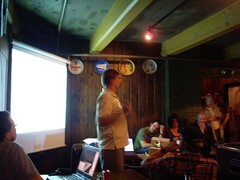 I had figured that attending the evening’s event was a good way to find a job. We later closed our conversation, and I felt it was a comfortable one. Minutes later, I saw him again, but this time with another gentleman. “Kimberly, I would like to introduce to you James. James, this is Kimberly. Kimberly is looking for a job.” Thanks to the mayor, I met the recruitment team of Bridge Technical Solutions. Now, I still do not have a job, but at least that is a start. WOW! Good luck–and if you get a job, does that mean you stay?? ?